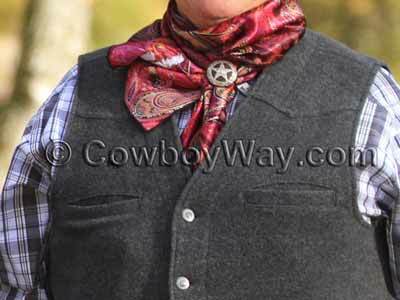 A "wild rag" is a cowboy or Western scarf worn around the neck. Wild rags are worn for warmth in cold temperatures, and for protection from sun, wind, and dirt anytime. 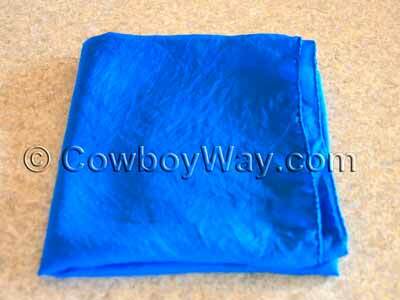 In many regions wild rags are a standard part of cowboy dress whether it be for work or social occasions. They come in a wide variety of colors, sizes, and fabrics, with silk being one of the most popular fabric choices. Below: A silk wild rag. Silk is a natural fiber that is light weight, supple, and breathable. Silk is very comfortable when worn next to the skin. Silk insulates very well. It keeps the wearer warm in cold temperatures, and is cooler than many other fabrics in warm temperatures. Silk is very absorbent and efficiently absorbs perspiration while wicking it away from skin. Silk is a very attractive fabric: It has a soft natural sheen, takes and holds color dyes well, and with minimal care can look good for years. With all of its benefits, silk can be somewhat temperamental to care for. 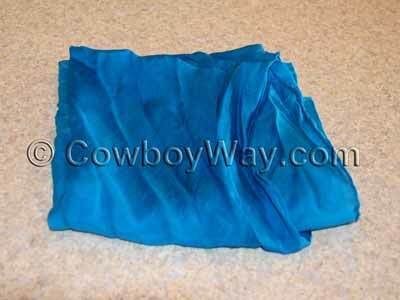 Below are some tips to help you care for your silk cowboy wild rags and keep them looking their best. If your silk wild rag came with care instructions from the manufacturer, use the manufacture's instructions instead of the tips or information you may find here. Heat is damaging to silk, so hot water should not be used. Silk does not take abrupt changes in water temperature well. Keep the water temperature constant, or change it slowly. Silk cannot tolerate stretching, twisting, or wringing. Avoid these things while washing and/or drying silk. Set the washing machine to its "gentle" or "delicate" setting, and a short wash/spin cycle. Set the water temperature to "cool" for washing and rinsing. If your washing machine doesn't have a "cool" temperature setting you can use "cold." Use mild laundry soap (not regular laundry detergent), hand soap, or some other type of mild soap such as hair shampoo. You can also use special soaps made for silk, but it's not necessary. Do not use bleach. Below: A soiled, deeply wrinkled silk wild rag in need of a wash.
Wash your silk wild rags with other silk items only, and don't crowd the washing machine. Crowding too many items into the washing machine could cause them to rub on one another or to get pushed up against the machine's agitator. This abrasion could gently damage your silk wild rags. While they would probably still be usable, they may lose some of their natural sheen and good looks. If you want to be extra careful, you can put your wild rags into a mesh bag made for washing delicate items, or a pillow case. If you are sure your silk wild rags are colorfast, you can wash different colors together. Otherwise, wash colors separately. Allow the wild rags to go through the wash and rinse cycles. You can stop here, if you like, and move on to the "To Dry" section. As an optional step, you can run your wild rags through another rinse cycle with approximately one-half cup of white vinegar added to the rinse water (the amount of vinegar will vary with the size of the machine, but one-half cup should be about right for most "small" load settings). The vinegar will neutralize any remaining soap and help to revive the color and shine of the fabric. Lastly, rinse the wild rags one last time in plain water. Below: The same silk wild rag shown above after being machine washed (using the optional vinegar rinse) and tumbled dry in a cool dryer. You can put your silk wild rags into a clothes dryer if you use a heat-free setting. Remove them immediately after tumbling. You can also allow your silk wild rags to air-dry naturally while lying them flat or hanging them. To keep them soft, give them a good shake several times as they dry. Do not put your silk wild rags in direct sun or next to direct heat to dry. This may damage the fabric or fade the color. Fill a sink with lukewarm water. You can also use cool water, but never use hot water. Also avoid abrupt changes in water temperature. Wash your silk wild rag with mild laundry soap (not regular laundry detergent), hand soap, or some other type of mild soap such as hair shampoo. You can also use special soaps made for silk, but it's not necessary. Do not use bleach. Gently "swish" the wild rag through the water to wash it, and avoid rubbing, stretching, or wringing the material. Allow the sink to drain, then refill it with fresh water about the same temperature as the wash water. Rinse your wild rag thoroughly with as much fresh water as necessary to remove all soap. Again, avoid rubbing, stretching, or wringing the material. Fill the sink with fresh water again and add one-quarter cup of white vinegar. The vinegar will neutralize any remaining soap and help to revive the color and shine of the fabric. Lastly, rinse the wild rag one last time in plain water. To remove excess water after hand washing, do not wring or twist the wild rag. Instead, roll your silk wild rag up in a clean, dry towel, allowing the towel to absorb the moisture. If necessary, do this a couple of times using fresh dry towels. Do not leave the wild rag in the towel. To finish drying completely, allow the wild rag to air-dry naturally while lying it flat or hanging it. To keep it soft, give it a good shake several times as it dries. Do not put your silk wild rag in direct sun or next to direct heat to dry. This may damage the fabric or fade the color. If your silk wild rag is wrinkled, you can steam it, press it, or wash it to remove the wrinkles. Keep in mind, however, that heat can be damaging to silk. Any heat applied to a silk garment to remove wrinkles should be as cool as possible, and applied for the shortest amount of time possible, to get the job done. 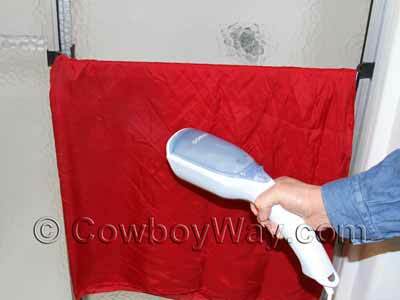 Below: A garment steamer being used to steam wrinkles from a red silk wild rag. Steaming Silk - Many people consider steaming silk the safer, preferred method to remove wrinkles when compared to pressing. To steam your silk wild rag you can use the steam from a hot shower, or a garment steamer. To remove wrinkles from your silk wild rag by using the steam from a shower, drape your wild rag over a towel bar in the bathroom. Be sure not to hang it where it might be hit with droplets of water which could discolor the fabric. Allow the room to fill with steam while one or several showers are taken. This method will usually relax most wrinkles enough so that using a garment steamer or pressing the wild rag won't be necessary. To remove wrinkles from a silk wild rag using a garment steamer drape the wild rag over a towel bar in the bathroom. Begin by holding the garment steamer several inches away from the wild rag, slowly moving it closer until you can see you are are getting results. Don't let any droplets of water from the steamer touch the silk as this could result in discoloration. If you need to you can hold the fabric gently taught as you use steam it, but don't pull on it aggressively. After steaming allow the wild rag to cool and dry completely before folding it or wearing it or you're liable to put wrinkles right back into it. Allow it to air-dry naturally while lying it flat or hanging it. Pressing Silk - If you choose to press your silk wild rag, keep in mind that excessive heat can quickly damage silk so pressing your wild rag or any other silk item can be tricky until you get the hang of it. If you have never pressed silk, it's a good idea to practice on a piece that won't upset you too much if you should accidentally damage it. Set your iron at the silk setting, and use the steam feature if it has it. Place your wild rag bottom-side-up on the ironing board, then place another fabric, such as clean, lint-free cotton, on top your wild rag so it is between the silk and the iron (a cotton bandana or dish towel works well for this). Press gently, lift the iron, then move the iron to a new location and press gently again. Do not keep the iron at any one spot too long or you could damage the silk. You can move the iron back and forth (actually "ironing" instead of "pressing") if you move it gently and take care not to stretch the silk under the pressure. If your wild rag is deeply wrinkled, try steaming it in the bathroom as noted above so that the steam can begin to relax the wrinkles. While the wild rag is still warm from the steam finish with the iron to remove any wrinkles that remain. After pressing allow the wild rag to cool and dry completely before folding it or wearing it or you're liable to put wrinkles right back into it. Allow it to air-dry naturally while lying it flat or hanging it. Washing A Silk Wild Rag - You can also wash a silk wild rag to remove deep wrinkles. Please see the section above, "Washing A Silk Wild Rag." While washing a wild rag should remove any deep wrinkles, it likely will not remove smaller ones. Wild rags are usually secured around the neck by a scarf slide or some type of fashionable knot. To learn how to tie one kind of wild rag knot, please see our article How To Tie A Wild Rag.